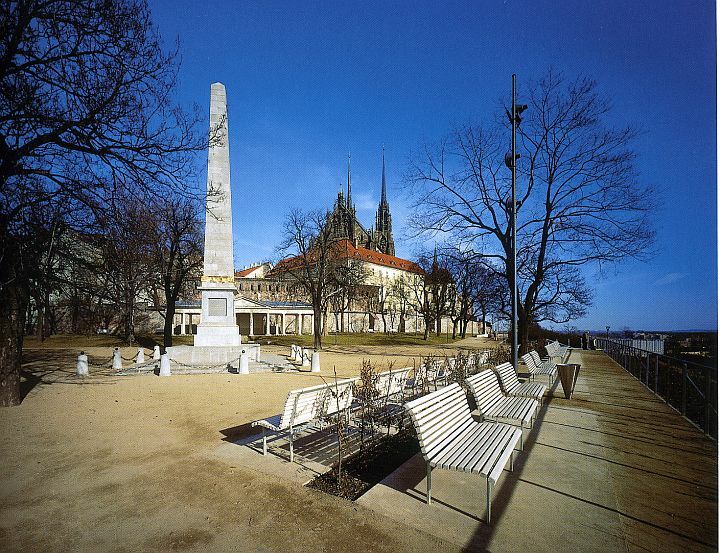 An historical vista ofthe obelisk, which additionally established the urban axis of the Brno belt road, was restored at the price of removal of a fair amount of unsuitable, modem wood species. In selected locations, moderniy designed terraces were integrated with carefully designed details of quality and solid materials. The design integrates the individual parts of the park. A newly conceived promenádě - a sidewalk from fine concrete with a segmented finish created by stone components with lights - serves as a design element. This visual axis connects, factually and allegorically, not oniy all the main directions buf also significant places. Moreover, it cuts through the originál colonnade, restores its originál function and heips establish the obelisk and its plateau as a sightseeing location. The slopes and terraces of Františkov are being gradually cleared of self-seeding vegetation, including lilac bushes and trees, and soil-protecting vegetation is being planted in their stead. The dramatic ground confíguration ofthe hill, including rock formations, will thus be revealed again, and its original grading and use ofgrapevine as a symbol ofthe cultural milieu and South Moravia will be emphasized.The effort to restore the first part ofthe park in a civicyet sensitive fashion culminated with the installation of a sculpture by Miloš Chlupáč, Moravia.